Application Note IGF007: Western (immuno) Blot Protocol for the detection of IGFBP´s. Application Note IGF007: Western (Immuno) Blot Protocol for the detection of IGFBP´s (May be used for other proteins as well). are dissolved in 900 ml demineralized water and the pH is adjusted with 25 % HCl to a pH of 7.4 and filled up to 1 l. As a preservative we recommend to add 0.05 % ProClin 300 (Supelco). The stock solution is stable for several months at 4 °C. Dilute 1 volume of TBS stock solution with 9 volumes demineralized water and add 0.05 % Tween-20 and 5 % non-fat dry milk and stir until the non-fat dry milk is suspended. Note: We use non-fat dry milk from our local super market, which is around 2.00 Euro per 250 gram pack. For control experiments for the direct IGFBP-3 Proteolysis Assay and the IGFBP-3 PROLICIA we recommend to use the conjugates and primary antibodies included in the kits. Other primary antibodies and conjugates may be used according to the instructions of the manufacturer. We have tested e.g. conjugates from DAKO with good success. For primary antibodies, we recommend to start with concentrations in a range of 0.5 to 2 ug/ml. We offer chemiluminescent as well as colorimetric substrates (see application note IGF005), but we have tested other substrates successfully, as e.g. KPL, Pierce, GE healthcare. SDS-PAGE for IGFBP´s has to be done under non-reducing conditions! The samples should not be boiled, please heat to 50 °C for 3 minutes. For our experiments we have used gradient gels (8-18 % T). Samples: The western blotting methods detects IGFBP-3 in human serum in sample volumes of > 1 µl. The detection limit for recombinant IGFBP-3 is equal or less than 0.5 ng, depending on the substrate. Blotting methods with higher tranfer efficiency may improve sensitivity of the western blot. DO NOT TOUCH THE MEMBRANE WITHOUT CLEAN GLOVES! 3.2 Incubate with primary antibody for 2 hours at room temperature (or overnight). 3.3 Wash three times with Blocking/Washing buffer for at least 5 minutes. 3.4 Incubate with secondary antibody for 1 hours at room temperature. 3.5 Wash three times with Blocking/Washing buffer for at least 5 minutes. 3.7 Incubate with chemiluminescent or colorimetric substrate. As an alternative chemiluminescent detection may be done firts followed by a wash with TBS and colorimetric detection. Note:For our experiments we have used at least 0.5 ml of each buffer or colorimetric substrate per square-cm of membrane surface and 0.1 ml of the chemiluminescent substrate. If smaller quantities are used, ensure, that the membrane is covered completely! 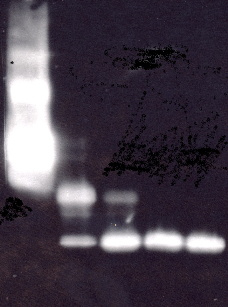 Example: Immunoblot of IGFBP-3 and fragments generated by proteolysis with plasmin. 10 ng of IGFBP-3 were applied in each sample to an SDS PAGE gel and the primary antibody (M02-IGFBP-3) and the conjugate of the Direct IGFBP-3 Proteolysis (IGFBP-3 Protease) Assay Kit was used for detection.